Read verifiable details of the "Paul is Dead" story that you have never heard it before, including William taking over The Beatles and the McCartney estate. Chapter 4 reveals how it was proven in court, in Germany, that the current Paul does not have the same DNA as the earlier Paul. Chapter 34 identifies the professor in Florida who first published the fact that the new and old Paul have different voiceprints, proving again that they cannot be the same person since each voiceprint is unique (like each fingerprint). Chapter 59 recounts the trouble that the current Paul got into in Japan when his fingerprints did not match those of the original Paul McCartney. 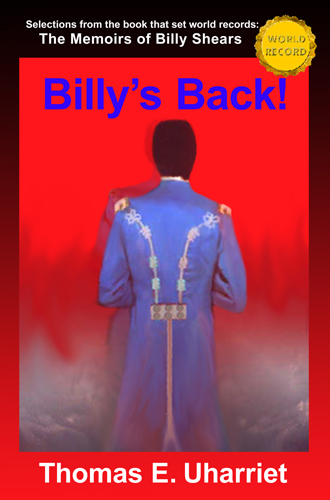 Throughout Billy’s Back!, you will learn to easily recognize their distinct physical differences, their personality differences, and the conspicuous differences in their singing and musical skills. You will also come to know the current Paul's inner-workings about how, even now, he deals with the identity-switch, and how he continues to work to please the Paul who has crossed over. Billy’s Back! 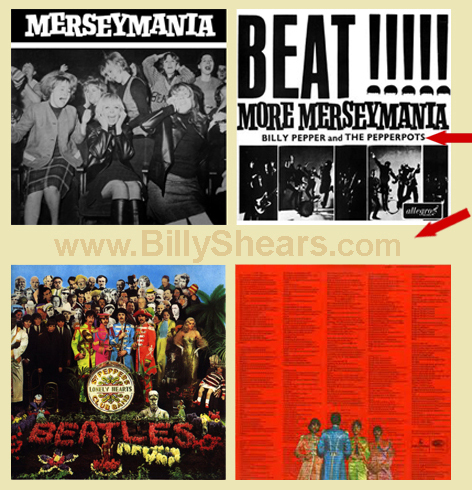 shows how William Shepherd ("Billy Shears") replaced Paul McCartney in The Beatles, revealing exactly how he went from being "Billy Pepper" of Billy Pepper and the Pepper Pots, to The Beatles' new "Sgt. Pepper" of Sgt. Pepper's Lonely Hearts Club Band. You will learn why Paul expected to die for the band, how, when, and why Paul and William each prepared for the switch, how the change occurred, and how the newcomer immediately took creative control of the band from John Lennon, making William Shepherd (as Pete Townshend put it) "the new boss." You will see how the switch in the band immensely improved The Beatles, but tormented them all, especially John and the new "Paul." Replacing Paul saved the band, but plagued each band member. Now you will understand their secret messages. While far more songs pointed to the switch than had been recognized, many of them were in protest of the new Paul. The friction between them began when the new Paul took over the band (on 16 September 1966), and continued for years after "Paul" disbanded "The Beatles." When you know what really happened and why, you will never again harbor any doubts of Paul's death and replacement by William. In addition, as you learn the background of the songs cited, you will never again hear those songs the same way. This book will forever change your perceptions of those songs and of Paul McCartney, John Lennon, The Beatles, The Rolling Stones, The Bonzo Dog Doo-Dah Band, Donovan, The Who, and Elton John--all of whom sang about Paul's replacement. Billy’s Back! reveals why global engineers had an interest in The Beatles, and how they used the media to manipulate the world into following that band, along with The Rolling Stones, to break down political and societal boundaries in preparation for the New World Order. Much of The Beatles' success stems from their part in a Tavistock project. Billy’s Back! includes the material from The Memoirs of Billy Shears that the public most wants to know of Paul's death and replacement, packed with many other fascinating details, without The Beatles philosophical attainments (See Beatles Enlightenment), and without their darker aspects, such as their Paulism, Satanism, and their Biblical humor (calling The Beatles the four-headed 666 Beast), which are all discussed in Billy’s Back!, but far more abundantly so in the unabridged Memoirs. Preserving the exact formatting from The Memoirs of Billy Shears, most printed versions of Billy’s Back! follow the same page numbering, skipping page numbers whenever pages from The Memoirs are skipped. Along with that same formatting, all of the pages selected for inclusion in Billy’s Back! has the same encoding including the same acrostical messages and word-stacking. Among the world and regional records set by The Memoirs, it includes the world's longest acrostic. You can read more about the hidden acrostical messages by following this link to the answer-key booklet, Billy Shears Acrostical Decoding. Click here, or the in the text box above, for more Word-Stacking samples. This revealing fact-filled work of historical fiction shows from William's own point of view exactly how The Beatles replaced Paul, what the secret messages really mean, and how you can be certain that they are true. 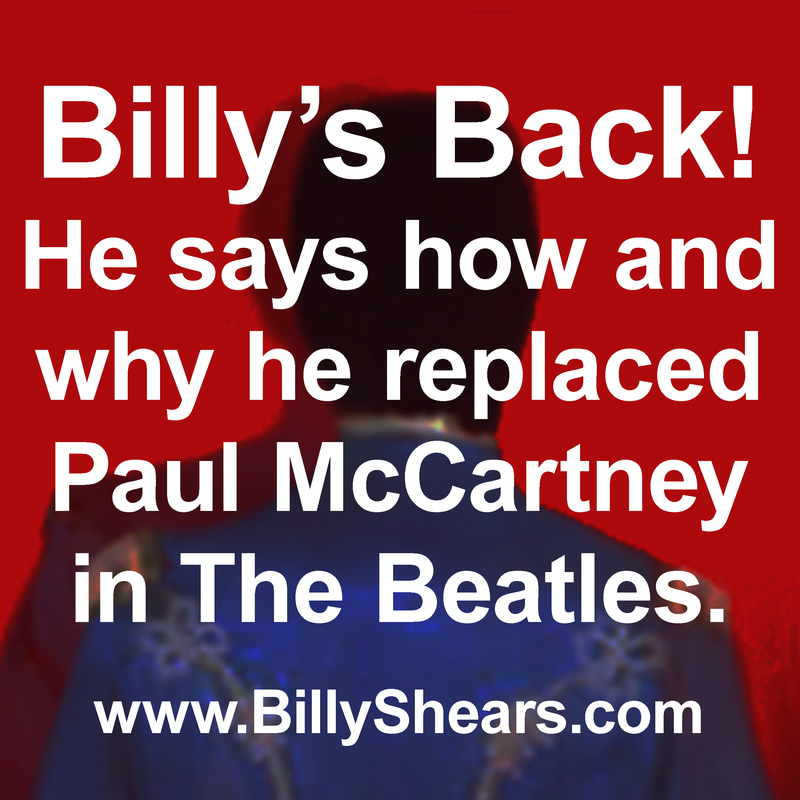 With all that it reveals about The Beatles, and of how global social engineers used the media to get the world to follow them into the New World Order, Billy’s Back! will forever change your view, not only of Paul McCartney and The Beatles, but of the world. Hardcover regularly $18.88, now ON SALE IN THE UNITED STATES for HALF PRICE! Sorry, this hardcover edition is not currently available for shipment outside of the Americas. Hardcover regularly $18.88, now only $9.44! Like the digital versions, this temporary print-on-demand edition does not have page numbering. Acrostic and word-stacking are not included in eBooks. This link is for all THE REST of what we would like to share about The Memoirs of Billy Shears and its related books. You will find a link to a website mentioned in the text, a Q&A section, and a link to CONTACT MACCA CORP and its subsidiary, Peppers Press. Until too many messages make it impossible to keep up, if you have a question not already answered in the Q&A, you might even reach the encoder, Thomas E. Uharriet. In the United States, Hardcover regularly $18.88, now only $9.44! Like the digital versions, this edition does not have page numbering. 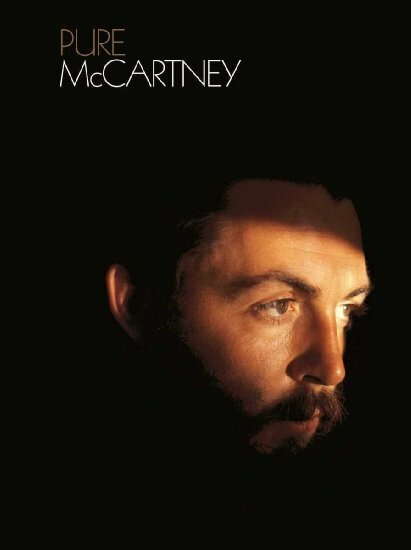 Get the 4 CD Set [Deluxe Edition] of Sir Paul's 2016 release, Pure McCartney! BillyShears.com Copyright © 2016, MACCA Corp.